The plan is set. 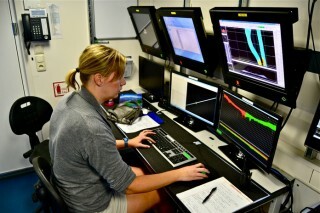 Tomorrow morning, the team from Deep Sea Systems International will launch their Global Explorer remotely operated vehicle (ROV) so we can begin exploring an area called Baker Bank. The last time anyone set eyes on this place was from a submersible about 40 years ago. The team decided to start here because it offers great possibility for discovery, but there’s also enough information available from the old days to confirm that for this first shakedown dive we’ll definitely find some rocky terrain of interest. On later dives, we’ll be delving more into the complete unknowns of areas never seen—and possibly even one of the hard banks no one even knew was out here until we passed over them today with the sonar. There were occasional exclamations coming from the control room when a bank-type feature popped up unexpectedly on the screen. We’ve completed mapping for the first several banks with multiple passes “mowing the lawn” as it’s sometimes called. The ship runs along a set path, then turns and comes back on a parallel track offset just enough to get complete coverage, like you might do with a lawnmower. As the mapped area grows wider, the rocky features of the banks themselves appear on the monitors as dark orange spots like islands in long expanses of deeper, flatter mud that show up greenish. 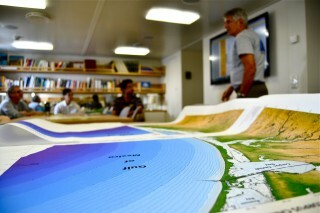 Tonight everyone focused on high-resolution maps created using the sonar data to find the best spots for work tomorrow. Once the ROV goes in the water at 8:00 a.m., the first goal will be to take video transects up the sides of one of the bank’s larger plateaus. 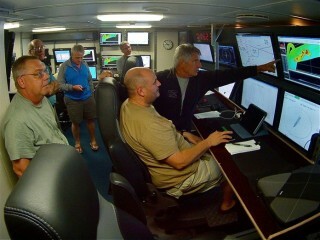 The pilots may grab some rock samples the lead geologist aboard, Andre Droxler from Rice University, can scrutinize. He’ll be looking of that ancient coral I mentioned yesterday—the remnants of reefs from the last ice age. Pieces of hard corals like elkhorns that only grow in shallow water will be nearly sure signs of an ancient history that Droxler can then confirm using carbon dating or other techniques. 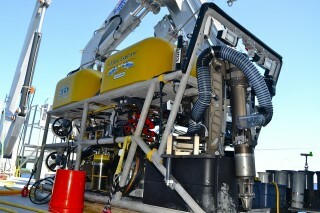 Then we’ll use Global Explorer back to collect samples of sediment and marine life. 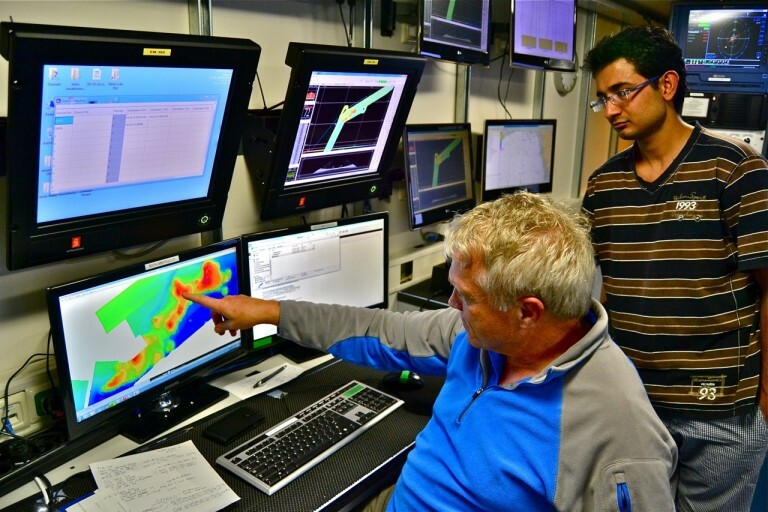 Chief scientist Tom Shirley is hoping for a diverse range of animals–things like shrimps, sea fans, urchins, and sea cucumbers, some of which ROV pilots will grab using a slurper vacuum collector. So little work has been done on the bottom here that we’ll have a good shot at finding species never before documented in the region, or perhaps even a new species. Shirley also expects we’ll be seeing “zillions of snappers,” along with small tropical fishes like damsels. And of course we wouldn’t mind spotting some of the Gulf’s larger predators passing through. Marlin and other billfish are a possibility, as are various shark species, including bulls, tigers, and hammerheads. Regardless, it should be a good day.